Redfern Jarjum College is a new Jesuit school, founded with the support of St Aloysius’ College. We are delighted to see the school come to life in 2013, after several years of planning and support across the community. 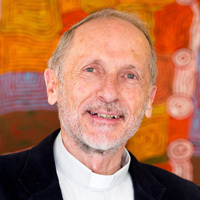 In many respects, Jarjum sees the Jesuits reaching back to earlier years when our community first worked alongside indigenous Australians in the late 1800s. The first Jesuits in Australia came from Austria and founded a mission in South Australia in 1848. Seventeen years later the Irish Jesuits also began a mission, this time in Victoria and ultimately Sydney. It is not widely known that in 1882 the Austrian Jesuits, along with some Australians who had joined them, established a mission among indigenous Australians on the Daly River (NT). Fr Donald MacKillop SJ, brother of St Mary MacKillop, was for many years Superior of that mission and a passionate advocate of Aboriginal people. During the 1970s a number of Jesuits returned to this early important ministry and today we are Aboriginal and non-Aboriginal friends walking as partners and building communities together. When Pope John Paul II visited Alice Springs in 1986 he spoke of the indwelling of God’s Spirit in Aboriginal culture and of the genius and dignity of Aboriginal people. The Holy Father also acknowledged the dispossession and suffering that followed white settlement. As we walk together now in Redfern, we acknowledge our need for the help and support of the Redfern Aboriginal community to make this new school truly responsive to the needs and aspirations of the families we wish to serve. The school will continue to foster the longstanding bond between our communities, drawing on the Jesuit and Catholic experiences in Aboriginal primary education and urban Aboriginal outreach programs.